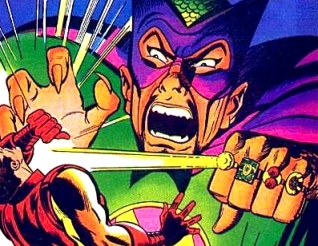 On Thursday, I’m gonna tell you about how Iron Man 3 should handle what will inevitably be its main villain: The Mandarin. But before that happens, I need you to understand why, despite his being inextricably tied to Iron Man in terms of “arch-nemesis,” there are some very, VERY good reasons they didn’t use him in the first two movies*. Keep in mind: These are the HIGH points of the character’s career. The ones worth noting on Wikipedia. Just imagine which stories were left off the page. I’ll be back on Thursday to explain how the character can still be salvaged. *And YES, I know about the whole “Ten Rings” thing from IM1. That was a fine idea. We will be talking about that too. Oh jeez … well, if you look at the Wiki breakdown of any serial fiction character, of COURSE it becomes absolutely ridiculous. This is one of Wikipedia’s many crimes. But that’s no judgment on your work still to come. Oh, no argument, Jefferson. Go read the entry on Daredevil supporting character Karen Page. It is downright SCHIZOPHRENIC. That is what happens when you are written by Stan Lee and then Frank Miller and then Karl Kesel and then Kevin Smith. It HURTS YOU. That said: These were the stories worth noting on Wikipedia. I’m not sure I’d like to read a Mandarin story that was too down to earth for it to be mentioned. I don’t even think that this is the most insane part of the Mandarin’s character. I think the most insane part is that he is an evil chinaman with ten magic rings that are actually alien super-weapons built by ancient space-faring Godzillas. 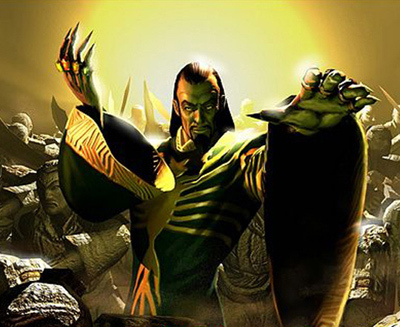 God, Iron Man 3 would be so great if they’d just use Fin Fang Foom.